Someone in Ingolstadt is putting ecstasy in the water supply. 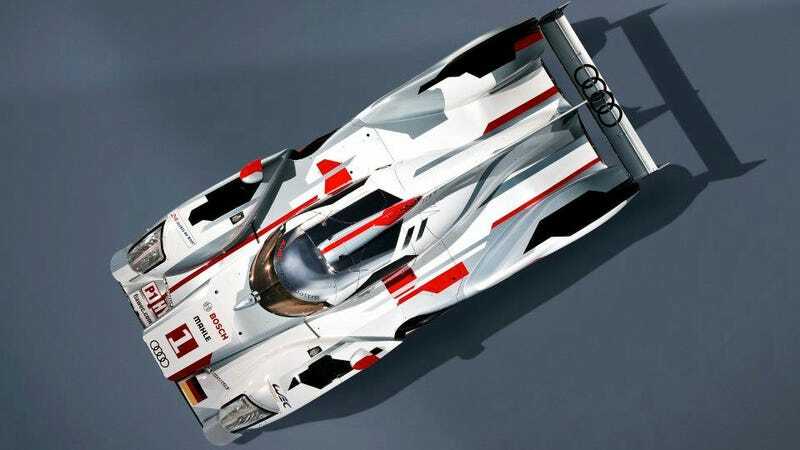 It's the only way to explain how the Audi R18 Hybrid we've heard about became this diesel hybrid AWD race car. Get your glow sticks out, we're about to rave to the Audi R18 E-tron Quattro. Details are just being released, but from what we've seen the latest addition to Audi's award-winning racing stable is this "e-tron quattro" racer. Annoying capitalization aside, the LMP1 car is the world's first to have a diesel-electric hybrid system that mates the car's usual TDI engine out back powering the rear wheels with electric motors up front to power the front wheels. When Audi started dropping hints of a hybrid racer you might have assumed there'd be some sort of lame gearbox-based setup. You'd have been wrong. The R18 grabs kinetic energy from braking and feeds it into a flywheel accumulator and puts it out through the front with electric motors. In case you were curious about how this fits into the racing season: yes, this car is going to race at Le Mans. Audi is bringing four cars to the 24 Hours of Le Mans. Two of them will be the Hybrid and two of them will be the R18 Ultra, which is basically a lighter version of last year's car. Both cars are identical but for the hybrid system. It'll be competing with the Toyota Hybrid Prototype, who is picking this up where Peugeot left off. June can't get here quickly enough.